No metal cutting saw is complete without the right blades and accessories to go with it. With six blade types to choose from, each with between 5 and 50 size variations available, all general and industrial sawing needs are taken care of at MACC. With distribution centres located across the country, every blade and accessory listed on our site can be easily accessed Australia wide. 250mm to 350mm Diameter. Blank blades which can be toothed to suit your requirements. 160mm to 400mm. Suitable for general purpose steel cutting. 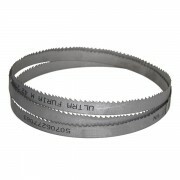 We stock bandsaw blades to suit every MACC bandsaw model available. We have over 50 varieties in the range with various lengths, widths and number of teeth. These straight, horizontal blades are ideal for general purpose cutting, and blade types are available to suit all bandsaw models we have in stock. Our HSS DM05 coldsaw blades are standard blades suited for general purpose metal cutting. With diameters ranging from 160 mm right up to 400 mm and between 80 and 350 teeth, the range is truly extensive. Choose the style, cut and shape of your blade with blank coldsaw blades that can be toothed to suit your requirements. These blank blades have diameters ranging from 250 mm to 400 mm, thickness ranging from 1.6 mm and 3 mm and bore between 32 mm and 40 mm. Get harder, stronger blades for your coldsaw with cobalt coldsaw blades. 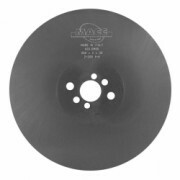 Featuring 5% cobalt content, these blades are well suited to cutting hard materials where higher temperatures are produced during the cutting process. 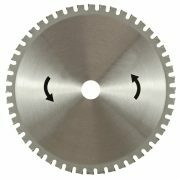 Our speed face coldsaw blades have a PVD coating to reduce friction and increase wear resistance. This durable coating helps to improve blade life and delivers an excellent finish to the cut metal. These blades are ideal for sawing steel that's hard to cut such as stainless steel and hard tempered steel. 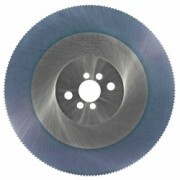 Tungsten carbide tipped saw blades are top of the line, delivering superior cutting quality for your T.C.T saw. This particular blade is well suited for cutting both ferrous and non-ferrous metals. Our T.C.T blades range in diameter from 230 mm to 400 mm with seven different blade options available. Get the most life from your blade by choosing the right blade for the job. Ensure you have the right blade width, length, pitch and material depending on the material type and size you have to cut. Each blade is designed for a particular use. Choosing the wrong blade for your saw could cause damage to the saw and hurt the user, so speak with our team to ensure you are choosing the right blade for your cutting machine. Synthetic metal working fluid or cutting fluid is a must-have for your metal cutting saw to ensure you get a clean and efficient cut every time. Our working fluid comes in 5 litres or 20 litres. Our standard synthetic metal working fluid is designed to use with most coldsaws, bandsaws and other metal working machinery where a recirculating coolant system is used. Our specialised working fluid has corrosion inhibitors which help to protect the machine parts and workpiece and deliver an excellent surface finish while also extending the blade’s life. We also have aluminium metal working fluid for use with high-speed T.C.T cutting saws – extending the blade life and delivering an excellent surface finish for your cut every time. We have two stands to suit MACC bandsaws. When your bandsaw has its own dedicated stand, you have more bench space for your other work, and your bandsaw has its own dedicated place in your workshop. Each stand is specially made to suit these bandsaws, so you can trust that your bandsaw will be completely stable and secured in place while sawing, giving you the ideal working platform at just the right height to complete your work. We sell all the saw accessories to suit your MACC bandsaws, coldsaws, T.C.T saws and friction saws, giving you the ideal working conditions to complete your metal sawing work. Request a quote or call us today on (07) 3287 1114 for nationwide or international purchases and delivery.